New emotions coming from the North by Agonist. An olfactory pyramid always ahead of its time: this is the golden thread in every Agonist creation. Unisex fragrances, products with 100% natural essences, inspired by the climate and culture of Northern Europe, in which design and purity come together, each characterized by the matching of unique essences, conceived in close collaboration with renowned perfumers. Solaris, is the new season’s fragrance inspired by the vibrant light of the midnight sun that is typical of the Nordic summers. Fresh and warm at the same time, thanks to the olfactory roundness of its notes, this fragrance encapsulates the same magic as those never-ending sunsets, that last even after midnight. The notes feature pink grapefruit, lemon, tangerine, black currant, petitgrain, black pepper, ozonic notes, peach, ginger, galbanum, tonka bean, benzoin, labdanum, patchouli and ambergris. 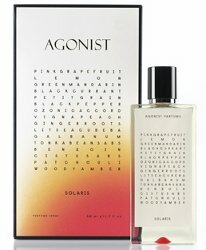 Agonist Solaris will be available in 50 ml Eau de Parfum, in an art glass edition (not shown) or spray (shown, €125). Might be! The art glass bottle is gorgeous…will post when I find a good image. They seem to be releasing some of their fragrances using this design.. If you go to their website you’ll see the bottles with the name on the top and the notes below.